. . .re in, such a noble feast, after living so long on barley cakes; so, seating herself, she said, "Chair of my grandmother, take me quickly to the palace of King Winwealth." standing in the midst of a wide plain covered with cornfields, orchards, and villages. 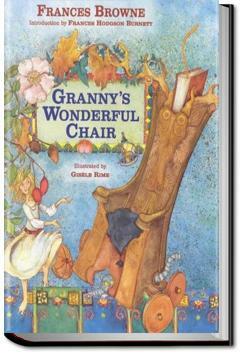 This is one of my favorite books from when I was a young girl. Fairy tales at their best! I was lucky enough to read an original edition of this book, and I loved it. This is a wonderful collection of fairy tales in the self professed vein of Hans Christian Anderson. The names of the characters are a little clunky, but they were written that way to make a point, and the point should not be lost, because each tale has a definite moral to the story. This is an excellent book with excellent stories. It is like having many books in one. My granddaughter will love me to tell her of all the adventures in this great book. It was a very beautiful book.I really enjoyed the time that I spent reading it.I don`t have any special favorite character because I liked them all. What I learned from this book was that good people and hardworking ones will always have what they really deserve in the end.